For a long time I was a massive fan of Andrew Weatherall. He was a musical polymath, and so a useful guide for a variety of underground musical styles. I would devour any interview or magazine Top Ten he compiled. When I first discovered him, it was through indie dance remixes, and then techno and trance, but later on he moved on to rockabilly and early 80s punk funk. I can’t remember which Top Ten this album was on, probably a Rock n Roll one, but I know that ‘Live at the Star Club’ was number one in his chart and he’d just added, ‘this is the greatest live album ever’. I am not usually a fan of hearing live albums as I think it’s almost impossibleto recreate the electric atmosphere of actually being at a great gig. But a recommendation like that from Andy Weatherall? I was sold. And it is a raucous beast of a record from the opening number. I love some of the classic Jerry Lee Lewis records, but the production is pretty tame. The recording on ‘Live at the Star Club’ is the sort of thing I’d expect master producer Steve Albini to do i.e. sticking a load of microphones near the instruments to create an incredible roar of sound. It’s the sort of thing that sounds easy to do, but really isn’t. 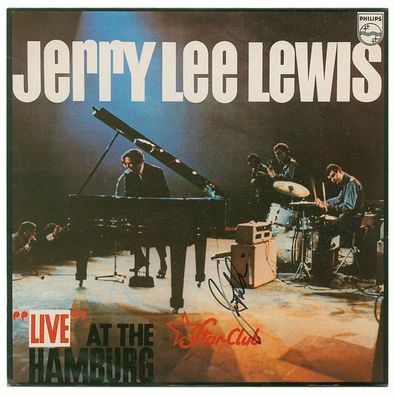 Jerry Lee sounds like he’s almost assaulting his piano, he hits the keys so hard. His band, the rather confusingly-named Nashville Teens (in that they were from Surrey) provide a super tight backing. And the vocals are a deliriously joyful, rock n roll primal scream. Some albums are complex, and only reveal themselves after repeated listening. This album is the essence of what is so wonderful about early rock n roll, and was then revived in the best of punk rock. It is stripped-down hedonism, the essence of youth, and provides instant gratification. It is a famous album amongst music geeks, but doesn’t seem to have ever crossed over to a wider audience. If you haven’t heard it, I really can’t recommend it enough.